When Chromecast first hit the scene last year, its insanely low price turned the set-top streaming market on its head. Sure, it wasn’t a set-top in the truest sense, but it provided many of the same functions, and thanks to an update announced today amid the I/O keynote event, it will soon offer a few more. 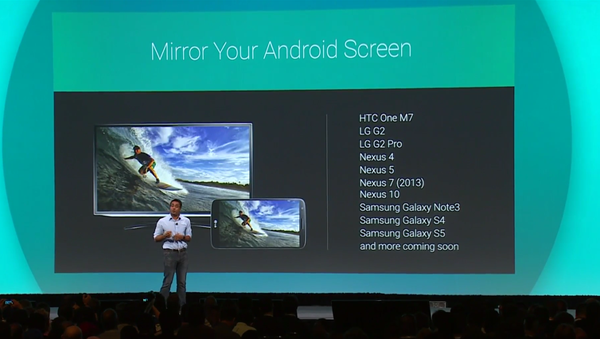 Notably, a new Android Mirroring feature is upon us, giving owners of the minute device a way of projecting their device’s display directly over to their TV sets. Apple TV’s neat AirPlay Mirroring feature is seen as a prime example of the harmonious manner in which the Cupertino’s devices function in perfect sync with one another, and Google is clearly shooting for something similar following a bunch of unifying announcements this morning. The $35 Chromecast, which looks more like a USB dongle than a streaming device, connects directly into the HDMI port of your TV, allowing you to stream all manner of content with consummate ease. Today’s update, which won’t roll out just yet, also adds a neat background display feature by the name of "Backdrop," which lets an Android device stream content onto a TV even when connected to different networks. Chromecast has sold in massive numbers, and Google has felt it time for the streamer to get its very own, centralized portal for apps. 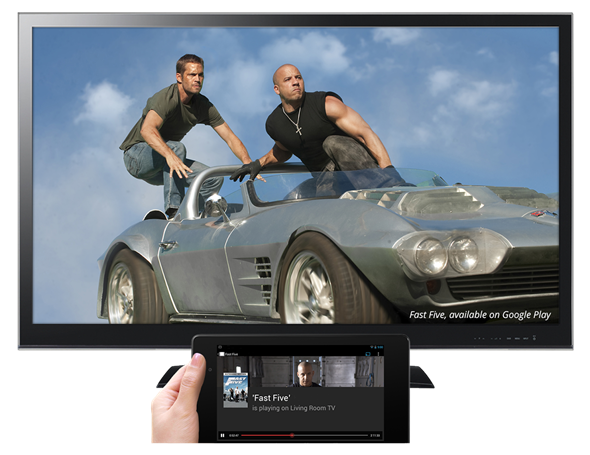 As such, users looking to discover new content specifically tailored to the device can do so by heading to Chromecast.com/apps, while the Play Store will also be getting its own, dedicated section as the expansion continues. With Chromecast soon able to connect to devices on different networks, your buddies will be able to push content without bugging you for your Wi-Fi password, which is still one of the more cumbersome customs we must abide to in this Digital Age. The big update to Chromecast, which will begin rolling out in the summer, will help the streamer to cement its position as one of the major players in the field right now, and with Android Mirroring being among the flagship features, one has to wonder how rivaling set-top boxes will continue to compete with this pocket-sized wonder. It will also be interesting to see if the new features entice new users to drop their current set-up for the Chromecast.